Yeah, any combination of letters means something. So, u practice in California. cuz thats the only state completely burdened by CNA. Congratulations, you have the privilege of being in a state that gives unfair advantage to unions. Like so many threads, you may eventually realize that truth is more important than paying union dues. then again, my post will be flagged. either way. Yellow bird gets this. (I'm here only to fulfill my promisde to you mister yellow bird.) Oh, btw.... If you can type and post here, u'should get those acronyms. yet another thread where someone wants to prove something that simply is not true. 12's are as safe as 8's, most nurses prefer 12's. So let's see if we can make a thread where it seems like the opposite. This is an an.com tradition, see the threads about pandemic flu or do nurses eat their young. Somehow all that happens is that there are fewer participants, seems few buy the "stuff." but let's keep trying.... could be we will fool somebody. Here's a cheer: "Eights are great, let's celebrate...." Well someone could believe that. Say it fast and with lots of enthusiasm. 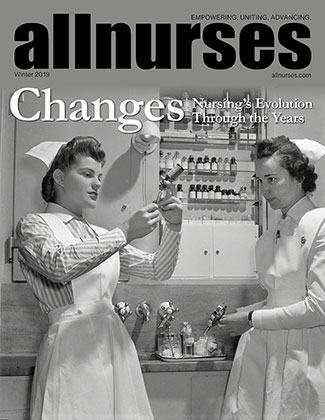 Here's a link to a well-written article, with citations: http://www.swbooster.com/Opinion/Letters-to-the-editor/2010-11-03/article-1921236/Nursing-errors-reduced-as-a-result-of-12-hour-shifts/1 This topic has been discussed and plenty of research has shown that 12 hour shifts are no more prone to errors than 8 hour shifts. The problem is that this is an old topic, which was well researched. More recent evidence will be hard to locate. Is it okay for a CNA to call herself a nurse? How do you incorporate faith into your daily nursing tasks? Yeah, I'm probably posting a rely in the wrong thread. Evolution theory takes as much faith as creationism. First how do you account for biogenesis? Scientifically, we can account for how amino acids formed from the "primordial soup." It's a little more difficult to account for how those amino-acids formed polypeptides, but if you squint, it sorta makes sense. Now how those polypeptides eventually formed something resembling life.... a little harder. O.K., no faith needed. Even though no theory can explain the above, let's move on. Which theory accounts for Eukaryota? No current theory reasonably accounts for this. But, by faith, we can believe that it happened, and by fact we can know that eukaryotes are more successful. There are a few more bumps along the road, like how do you account for the evolution of phyla cordata? So, faith means believing in something not proven. Evolutionists most decidedly have every bit a faith equal to mine. (likely more) We just give credit to different authorities. Websters first definition is about Breast feeding. Thank you, I appreciate honest feedback. What I am attempting to say is that we should refer to ourselves as professional nurses. Then, eventually, the general public will get it. We are not handmaidens to medicine, we are healers. We respect and honor the second definition from Webster, we just know a little bit more. Still, I'm attentive. Teach me how it is wrong for a CNA to call herself Nurse. Amen. Science reveals Gods universe! LOL, we see it differently, and that's great. Huh? Look, I know that lots of posters need to be right. I could care less. I like it when I'm wrong. And yes, you guessed it, I'm pretty happy most of the time. I really want to get this. I'm just not so good at communicating my misunderstanding. This vs. that. Atheists are spiritual beings. They see it differently. Those who do not have a belief that life has meaning, and a purpose, are the ones who have no faith. An atheist may not call it faith, but "What is in a name?...." Yes, us vs. them is ugly. We have only one enemy. I'm not sure, but I think, in American English, it's called apathy. No sarcasm intended. We do read words differently. I like to pray. I pray for the things that I already have been given, but don't have the sense to use. I pray, everyday before work that I remember that the patient's health is most important; that I don't mess-up; that I know that my little stuff had little to do with the patient getting better; that I remember that I'm part of a team; that I'm grateful for the times that I remember the fact that i'm just privileged to be there at bedside and not in the bed...etc. Others use different spiritual interventions. Prayer is just what works for me. "One who looks after, fosters or advises." is Merriam-Webster's second definition of a Nurse. That is what a CNA does. But, I'll post a link to this thread to Merriam-Webster and advise them to change that second definition because using the word in that way is a crime, unless you have a license. I am getting more clear on this. Calling oneself a nurse is using a title they have not earned. Even though "nurse" has many meanings. It would not seem to be easier and more helpful to the patient if we called ourselves by the true title Registered Nurse or Licensed Vocational Nurse. Those titles are clear and have specific meanings. The Consensus here is that we should instead change the meaning of "nurse" to be only those people who are licensed. I won't follow the majority, but I think I understand. I must be sure to caution lactating mothers to not claim to be nursing. Examples of someone claiming a title then preforming an action out of their scope of practice is quite different. Simply referring to yourself as a nurse, in most states, only subjects you to BON sanctions. The earlier urban legend "a friend once told me...." not withstanding. I begin to see why so many people see us as arrogant. The title "nurse" has too many meanings. Better wording to protect the title "Registered Nurse" or "Licensed Vocational Nurse" would perhaps give some meaning to a protected title. I believe the thread was about the CNA calling herself a nurse. Not about the CNA practicing as a nurse. There is a difference. I seem to have a compulsion for repeating myself. So, in answer to the OP. I do not think it's wrong for a CNA to call herself a nurse. As long as she does not try to practice as a nurse. I often wish those who hold the license would practice as a nurse but I bet that's another thread. That pretty much sums up what I have been attempting to say. A couple years ago, I introduced myself as "your nurse..." The patient's family member immediately asked "are you a Registered nurse?" That's when I realized that the problem is not in who calls themselves a "nurse," but in what we do by not identifying ourselves as professional nurses. Yes, some states have very poor wording and actually protect the title "nurse." I still seriously doubt that anyone has ever received any kind of legal sanction for calling themselves "nurse." I once met a social worker who said "I'm like nurse for a psychologist." I guess she's right, sort of, but a professional nurse doing a similar job would likely be called a Clinical Nurse Specialist. Let those who want to call themselves "nurse." Identify yourself as the professional nurse, if you have earned it. Eventually, people who are not in health care will see the difference and ask "Are you a Professional nurse?" So still, I have no problem with a CNA calling herself a nurse. The patient will get it when it comes time for medications.